Ethnomusicologist Philip Bohlman has argued that "music affords power to those who search for meaning". Such is the power and appeal of the Western classical tradition that symphony orchestras now play in regions far distant from the art form's Judeo-Christian heartlands. 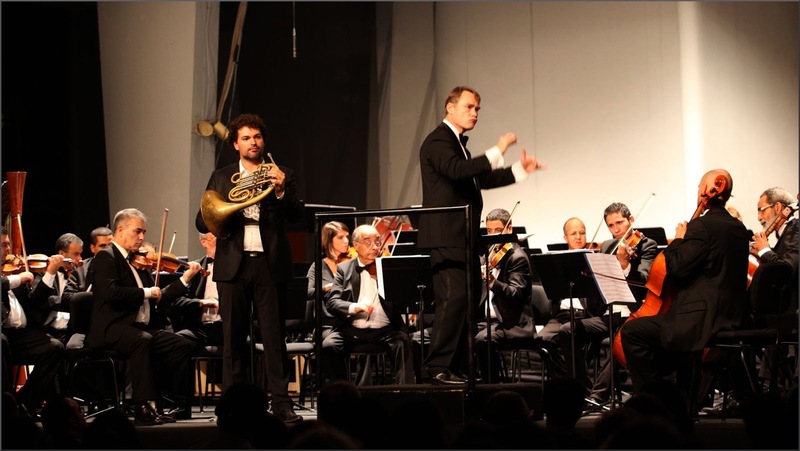 When in North Africa recently I attended a performance of the Mozart Requiem with Olivier Holt conducting l'Orchestre Philharmonique du Maroc (Philharmonic Orchestra of Morocco). Before the concert my expectations were not high: because there is no tradition of Western classical music in Muslim Morocco, and because Essaouira where the concert was taking place evokes Jimi Hendix more than Mozart, . But despite this, conductor Olivier Holt's mastery of his Moroccan vocal and orchestral forces resulted in a Mozart Requiem of notable power and intensity. 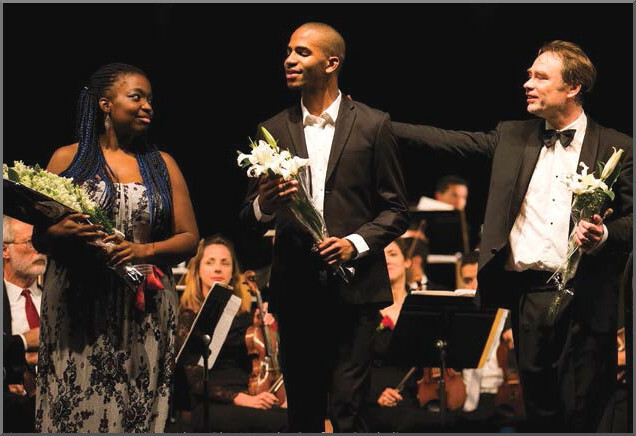 That is Olivier Holt in the header photo with Axelle Fanyo and Edwin Fardini at another concert in Essaouira. Olivier Holt will be unknown to many readers; he is one of the under-appreciated peripatetic conductors who work tirelessly and effectively to promote classical music without the rewards of the celebrity maestros. 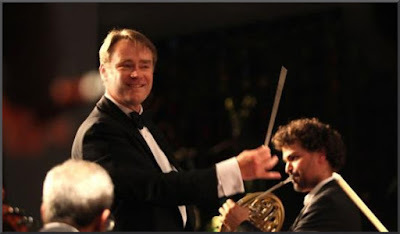 He was born in Paris in 1960, studied at the Hochschule für Musik and his subjects included piano and percussion as well as conducting, and among his mentors were Leonard Bernstein and Charles Mackerras. .
Bob Shingleton: Olivier, welcome to On An Overgrown Path. I know that many readers will be interested in the references to Leonard Bernstein and Sir Charles Mackerras in my introduction. So let's start by hearing about your contact with them. 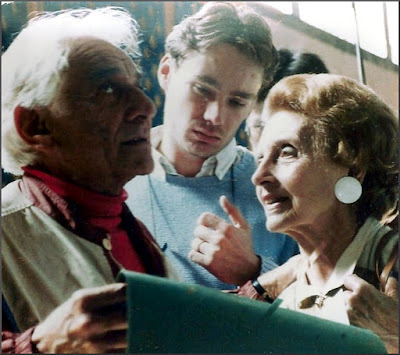 Olivier Holt: I passed a competition to attend the Masterclass in Vienna with Mackerras in the summer of 1981. The classes mainly focused on extracts of Mozart’s operas. There were also young singers and a Bulgarian orchestra, I think. Mackerras was considered to be a baroque conductor at the time, he had us work a great deal on ornaments, cadences and appoggiaturas, and look at the manuscripts, which was very instructive for me. He often scolded me for my left hand, especially for accompanied recitatives... We also sang choral parts or secondary roles, which was very amusing. He had begun to talk to us about his interest in Janacek which was budding. What I retained from him is the absolute necessity in music to go back to the original writing. Lenny's joy and passion for music and people was contagious. He was very available for everyone. At the same time he was finishing up a tour with the Concertgebouw, I remember his Schubert’s Symphony no. 5 as light and joyful. I was backstage waiting with his assistant who handed him a lit cigarette, and the Maestro walked onto the stage blowing out the smoke right next to the double basses... Despite it all he was tired and wouldn’t show up for class some mornings. We spoke quite often about painting and literature. He had a burning passion for European culture. And he introduced me, aged 27, to whisky. BS: I have mentioned your work in opera; what are your latest projects in the opera house? OH: I toured in France and Martinique with a rarely played opera by Gluck, Merlin's Island or The World Upside-Down, and last month I conducted Carmen in Rabat with l'Orchestre Philharmonique du Maroc and Chorus with an entire cast of French singers. BS: This is your first year as artistic advisor to the l'Orchestre Philharmonique du Maroc [OPM] which is based in Morocco's capital Rabat.. How much time will you spend with them? OH: As much as possible. The OPM puts on six programmes per season and I am conducting three this year. BS: Morocco was a French protectorate until 1956 and French is widely spoken. But Morocco is part of North Africa with strong links to both sub-Saharan black Africa and the Arab world, and its indigenous population of 33 million has no tradition of Western classical music. In fact Morocco is celebrated for its ethnic music from brotherhoods such as the Gnawa and the Master Musicians of Jajouka. Despite this l'Orchestre Philharmonique du Maroc was founded in 1996 and is flourishing. Who founded the orchestra and why? OH: The OPM was founded by Farid Bensaïd who is also the leader of the first violin section. 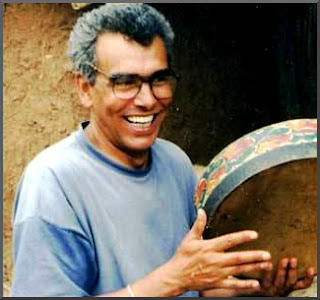 His secretary-general is Yassine Matjinouche, who is also a violinist. They both studied music in France. The orchestra’s mission is of course to communicate, share and educate but also to professionalize Moroccan musicians. BS: Tell us about the first time you conducted in Morocco. What were you expecting? And how did the reality match your expectations? OH: I came for the first time in 2012 to accompany the piano competition. I discovered a group of enthusiastic musicians. My first impression was good because the OPM was performing a programme that the musicians knew pretty well. Our second programme together for Beethoven’s Symphonies no. 6 and no. 4 was more difficult. It wasn’t a question of the notes but more what lies between the notes that the orchestra needed to watch out for and getting them to hear a poetic style. BS: Funding is currently a big issue for symphony orchestras? How is l'Orchestre Philharmonique du Maroc funded? OH: The OPM is mainly funded by private partners. BS: Tell us about the make up of the orchestra. How many of the players are Moroccan , and how many come from Europe and elsewhere? OH: When full-size the orchestra has 60 to 70 Moroccan musicians. There are also one Bulgarian, one Hungarian, one German and two French players who are local, and depending on the programme 3/4 French players who come over to play. BS: It is impressive that more than 80% of the musicians are Moroccan. Quite understandably it is mainly European conductors who are currently working with the orchestra, although I know Rachid Regragui, who is a graduate of the Moroccan National Conservatoire in Rabat, has also conducted some concerts. Looking to the future, will there be more opportunities for Moroccans and other non-European conductors to work with the Orchestra? BS: The orchestra's programmes are very much rooted in the mainstream classical tradition. Do you see that changing and the repertoire widening? OH: We are at the intersection of two ideas: a need to develop our sound, to continue to work our repertoire more and more, and the need to open up. Here are some of our upcoming projects: Mahler, Stravinsky, Sibelius and Wagner! As for 20th and 21st century works, they will come gradually. BS: Maurice Ohana was born in Casablanca in 1913. Are there any plans to perform the music of this seriously underrated Moroccan-born composer? Or is that a step too far? BS: The orchestra's programmes do not include fashionable fusion projects such as concertos for kora. What are your views on that kind of blending of classical traditions? OH: There have already been projects like that. The orchestra has often played mixed programmes with specially orchestrated Andalusian music. There is something in the works soon with Scheherazade. BS: I mentioned that you conducted the world premiere of Dominique Probst's opera Motherland. Are there any notable living Moroccan composers that you would like to programme? OH: Yes, Ahmed Essyad [seen in photo below] who was born in Salé in 1938 and was a student of Max Deutsch in Paris, who himself was a student of Arnold Schonberg. What an impressive heritage! BS: I couldn't help but notice at your concert in Essaouira that there were very few women players in your orchestra. Do you see that changing? OH: The new generation is on its way, because the orchestra is involved in the Mazaya project and the balance is 45% girls. We will need to wait another 8/9 years before bringing them into the orchestra. BS: What is the most amusing culture clash that you have experienced in your time with the l'Orchestre Philharmonique du Maroc? OH: The orchestra has the same tendencies as other orchestras around the world. It slows down in the same places, and speeds up when it shouldn’t.... When something wasn’t working right the musicians would say to me "Inch'Allah" (if Allah is willing). After a while I explained that I didn’t want to hear "Inch'Allah" any more during rehearsals, that God had other things to do besides worry about us, and that we needed to work... Now we don’t say "Inch'Allah" during rehearsal any more, but always outside after the work is done, just for laughs! BS: I was very impressed with that Mozart Requiem in Essaouira, despite the town's Salle Omnisports not being an ideal venue for Western classical music. How do the other auditoriums the orchestra plays in compare? OH: The orchestra is very familiar with its five or six venues in Morocco, but like a teenager it sometimes has a hard time finding the right sound, its identity, in the different acoustic environments. It’s a problem all musicians face when touring around the world, like pianists who have a new instrument in every concert hall. BS: Does l'Orchestre Philharmonique du Maroc tour outside Morocco? OH: Not for the moment, but last February they came to Paris to play Verdi’s Requiem with other musicians from North Africa. The orchestra played by the name of l'Orchestre Philharmonique du Maghreb. BS: To conclude let's take a wider perspective. At the start I talked about your work founding l’Orchestre Symphonique d’Europe, a professional orchestra of young musicians from across Europe. Attracting a wider and younger audience for classical music in Europe and North America is the hot topic. What do you think is the key to reaching new audiences? OH: This is a vast area for work but in the world of classical orchestras progress is under way. Remember Bernstein and New York in the fifties (and all North American orchestra). In France we have been slow to open up to diverse cultures in this field and reach out to young people. Now all organizations are doing it. Fortunately, in Morocco this effort has been made from the start. The keys are education, performances for schoolchildren, blending cultures and repertoires. We owe it to ourselves not to leave anyone behind. That’s our mission, to always strive to touch people, not only with Bach through all the rest, to delight the musicians and the audiences, to provoke curiosity, joy and sharing. BS: Olivier, your observation that the conductor's mission should be to provoke curiosity, joy and sharing is so important and so true, but it is so often forgotten today. We also forget too often that great music is being made not only by the prestigious ensembles of Western Europe and North America, but also by a diaspora of committed musicians like you working in often challenging conditions around the globe. Thank you for taking time out of your busy itinerary to talk to me, and I look forward to hearing more of your music-making in Morocco, Inch'Allah! Text is (c) On An Overgrown Path 2016. Photo credits: header Soufiane Bouhaliu, Bernstein photo is (c) Olivier Holt, Ahmed Essyad via Blanee, photos 4 & 5 via le 360. Any copyrighted material is included as "fair use" for critical analysis only, and will be removed at the request of copyright owner(s). On An Overgrown Path is on Facebook and Twitter.